Originally published in the Georgia Historical Quarterly 95, no. 3 (Fall 2011). By Paul K. Graham. Courtesy of the Georgia Historical Society. Edward Arista Vincent arrived in Savannah in 1851 educated, motivated, and savvy. The young immigrant from England, versed in architecture, engineering, and surveying, looked to Georgia’s budding inland cities as the place to launch a career. Driven and ambitious, Vincent completed four cartographic works and one major architectural project in less than three years—only to succumb to disease at age twenty-seven, in 1856. 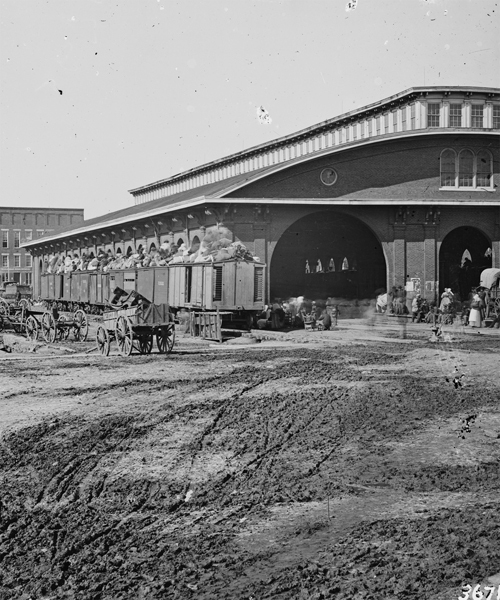 Vincent’s map of Atlanta became the blueprint for Sherman’s siege and occupation of the city, and almost eight years after his death the destruction of his Gate City railroad depot marked the beginning of the March to the Sea. Today, his maps provide a spatial record of three Georgia cities as the Civil War loomed. Contemporary records, together with his documented works, unmask this elusive historical character, revealing the triumphs and difficulties faced by a professional-minded immigrant launching a career in the antebellum South. The socioeconomic environment of antebellum Georgia provided enterprising young men with opportunities for rapid advancement, but success was often fleeting. 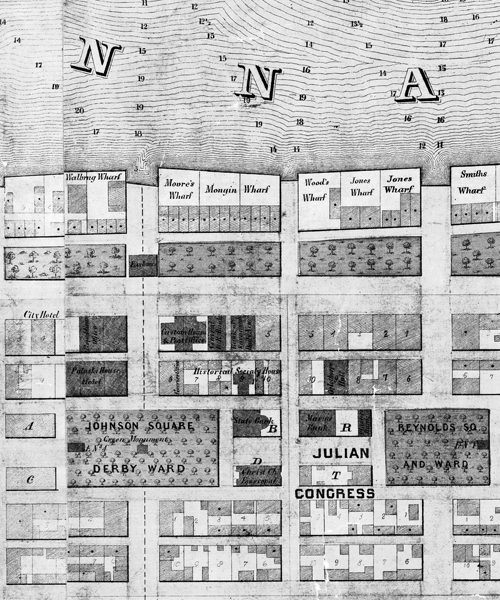 A selection of Vincent’s map of Savannah, 1853, showing squares and structures, including the “Historical Socialy [sic] House.” Note the seam between two lithographed sheets running vertically to the left of Johnson Square. Courtesy of the Cartographic and Architectural Division, National Archives, College Park, MD. Activity at Vincent’s depot during the Union occupation of Atlanta, 1864. Courtesy of the Library of Congress. Vincent’s financial situation tells only part of the story. He possessed all of the accoutrements of someone in his line of work. Second in value to his gold watch, Vincent owned a theodolite, an angle-measuring tool used by sophisticated surveyors of the era. Distance measuring tools included a surveyor’s chain, tape line, and yard measure. Dr. Currier, Atlanta’s city surveyor, purchased a set of plotting instruments at the estate sale. Vincent owned dozens of maps and drawings, including 123 copies of the three county maps published in 1854. One map (possibly an ordnance survey) offers a clue to his origins; he owned a “Map of Petersham” that may represent the locale in London. The record of Vincent’s estate sale includes an enumeration of the contents of his library, allowing for a nearly complete reconstruction of its contents. Volumes related to his professional development included City Architecture by Field; Elementary Principles of Carpentry by Tredgold; and “Art of Drawing,” likely one of two separate manuals for lithographers published in 1849 and 1851. The books also open a window into the young man’s personal life. He read popular romances but also delved into classical and philosophical literature. Religious works included a Bible, Alleine’s An Alarm to Unconverted Sinners, and Dante’s Vision. Vincent also had worldly concerns and was looking toward finding a mate; he owned a copy of Weaver’s Hopes and Helps for the Young of Both Sexes. Vincent’s architectural legacy continues today, albeit in a somewhat dubious fashion. In 1987 Stone Mountain Park needed a more substantial train station to accommodate increasing visitor traffic on its five-mile rail excursion around the mountain. The park’s general manager looked to Atlanta history for design inspiration and, after consulting with city historian Franklin Garrett, settled on the city’s first major passenger structure as his guide. Vincent’s car shed became the model for the new train station. Although called “almost an exact reproduction of Atlanta’s station” by the Atlanta Journal, a much-simplified amusement-park version emerged.22 At approximately three-fifths scale, the Stone Mountain station—a shadow of Vincent’s once-great work—lacks the architectural styling and detail that adorned Atlanta’s first depot. Provable facts about Vincent span less than five years, yet contemporary records reveal much about the professional efforts of an antebellum immigrant in the South. Following delivery of final proofs of his Savannah map to the printer in August 1852, Vincent saw a rapid rise in his career; he designed a major railroad depot and drafted maps of Atlanta and Macon in quick succession in 1853. Almost immediately upon expanding into Augusta in October 1853, Vincent’s fortunes began to turn; he never recovered from multiple professional setbacks through 1854. While documentation of his life primarily concerns his public actions, Vincent’s estate reveals the human being behind the name, showing a man concerned with worldly and eternal affairs. Following his death, the demolition of his depot, and the surge in detailed maps of Georgia’s cities following the Civil War, Vincent’s name largely fell from memory, surviving in brief accounts by local historians. While historical events quickly overwhelmed his legacy, the name Edward Arista Vincent belongs among those professionals who sought to make a life in the South and leave a mark on the region. Mr. Graham is a genealogist at ProGenealogists, a division of Ancestry.com, and resides in Salt Lake City, Utah. The author would like to thank the following individuals for their insights and research assistance: Glenda E. A. Anderson and Luciana M. Spracher, Research Library and Municipal Archives, Savannah; Farris Cadle; Deborah E. Harvey; Erick D. Montgomery, Historic Augusta; Kenneth H. Thomas Jr.; Robert S. Davis Jr.; and Gordon B. Smith.